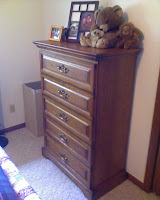 On Friday, we received two of four pieces of our bedroom set. Perhaps it is a popular set, but only two pieces that were ordered have arrived. The other two are on back-order and are supposed to be in this week. We should have them delivered by this coming Friday. 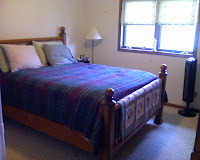 I have included pictures of the bed frame and the chest of drawers. The dresser & mirror and night stand are the ones coming soon. This coming Wednesday, we will be getting some additional furniture to round out the guest room and the multi-purpose/other room. It is our hope that by the first week in August we should have the house set up. Then, our next major project will be to get the basement put together. That will be a project that will need to wait until the fall, as a new carpet will need to be put down before we do any major work down there. The Strikeforce United Co-Ed team was a little short on players for tonight's game, so Christa and I helped out by playing. With a team consisting of 50% new players, we managed to win 14-2. Personally, I went 3-4 with 2 RBI and 2 runs. It's always more fun when you are on the winning end of the game. Everyone was also out there to have fun, which makes it less stressful. It's now past 11 PM though...way later than our bed time. Time to get some sleep. My parents came up to visit Christa and I today. They attended the 10:45 AM service at Oakfield. Afterward, we had lunch and my dad helped us fulling "connect" the house to the internet. We have wireless! 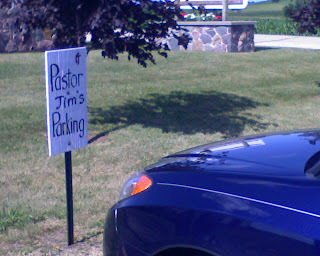 Later in the afternoon, I asked my parents if they wanted to see the church in Eden. I drove and parked in my parking spot. The sign has been officially changed (see left). Today is the anniversary of the tornado that came through Oakfield, WI in 1996. It was the only F5 tornado to be in the United States that year. The tornado actually came through the street that Christa and I live on right now. It destroyed the old Methodist church (which had just completed an addition) along with the parsonage. In total, 47 homes were destroyed and many more were damaged. Luckily, there were no fatalities. I encourage you to pray for those in the Oakfield community as there minds are probably on this anniversary. Thank you. For the first time in three weeks, I was actually able to play softball. Strikeforce United put out a good effort, especially in the seventh inning, but we still lost 8-6. Our fielding was really good in this game; we just couldn't score any runs. I went 1-3. After two pretty pathetic foul ball outs, I managed to knock a triple into center field, knocking one run in and eventually scoring on a single by the next batter. I managed to do a pretty decent job fielding, not allowing any balls hit my way to get past me. 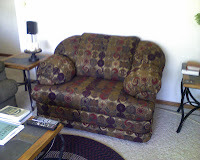 I thought I would post pictures of our new new sofa and chair. They arrived today and actually match well to the coffee table and end tables that we had also picked. Stay tuned for room photos as the house gets more put together :). It truly is a beautiful day today! Blue skies...gentle breeze...and it's 80 degrees. God must want us to get outside and enjoy the weather :). Christa is enjoying the weather working at Settler's Mill. I imagine there will be many folks playing mini-golf today. I did manage to get a walk in this afternoon, but I have been spending a lot of time filing and unpacking. I have also been practicing tomorrow's sermon. On a sports note: Last night's Brewers game was painful. I thought the Brewers could pull it out; it was exciting to watch. But six runs in the 10th inning is not acceptable. *sigh* Hopefully they can turn things around tonight. As mentioned before, we got the internet and cable hooked up on Thursday. Things feel more like home. We got our first batch of forwarded mail from Oshkosh. Wow...you do manage to get on a lot of bulk mailing lists in a few short years. Sunday is my first worship service at Oakfield and Tabor. I like the way the bulletin turned out and I think my sermon will help the congregation get to know Christa and I a little better. 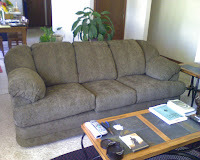 We get the new sofa and chair on Monday. I think it will provide a little more lounge space than we have right now. There are no stop lights in the city at all. The nearest one is probably six miles away. Luckily, you don't need to stop too much. Much of the city is surrounded by long, county roads, ideal for long runs. There isn't a whole lot of traffic in the city, so you can relax as you run around the area. There is a nice trail that runs through the city and goes both east and west from the city. It is often shaded which is very nice.